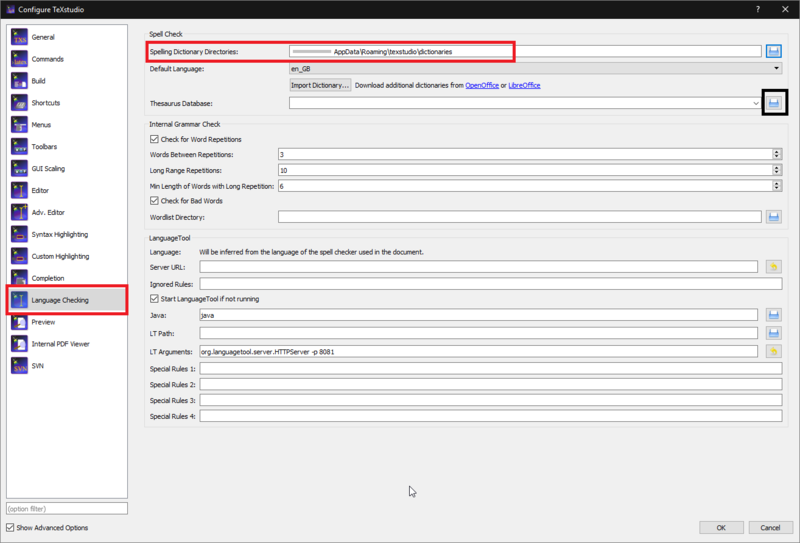 How to set up thesaurus in TexStudio? I have been able to set up the dictionary in TeXstudio, however, when I ask for Thesaurus, it tells me Thesaurus database not found. I did this on Windows, but I don't see this being much different for whichever OS you are using (Ubuntu, from the comments?). Also for the record, this is on TeXstudio 2.12.6 (hg 6632:7777b2b8a906). This solution is largely inspired by another one from StackOverflow, but I will supplement this with pictures, and to provide an answer here in TeX.SE. 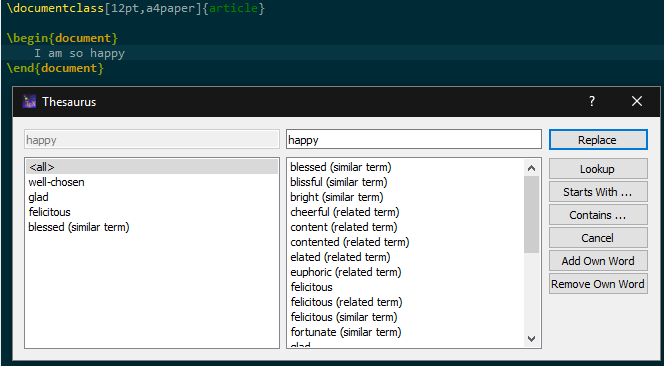 Hopefully this will be sufficient and clear enough to answer future questions about thesauruses in TeXstudio. If you already have a database (.dat file), then skip ahead to Step 2. If you can't find one in your language, I don't think there's much you can do except to create the database yourself? Go ahead and download the .oxt file. If you extract this .oxt file, using 7Zip or the likes, you should see a th_en_US_v2.dat and th_en_US_v2.idx file. and see the directory for your Spelling Dictionary Directories (indicated by the longer red box). 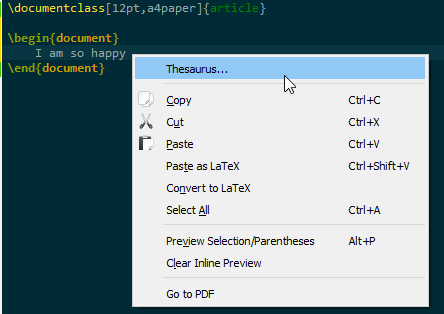 By default, this should link you to a dictionaries folder within your TeXstudio parent folder. 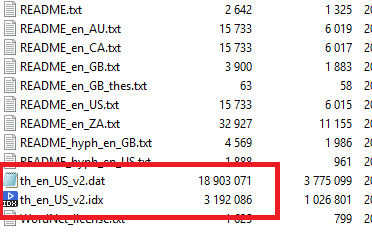 The end result should be the .dat and .idx files being in a particular folder (the texstudio\thesaurus folder, in my case). Step 3. The final step is to copy the directory of the thesaurus .dat file and paste into the Thesaurus Database entry in the TeXstudio options. Another (quicker) way is to click the icon (indicated by the small black box) in the above picture, and navigate to the folder containing the thesaurus files. Choose the .dat file, click ok and you're done! An alternative (default) keyboard shortcut for this is Ctrl+Shift+F8, which opens up the same thesaurus window for the word your cursor is currently sitting on. TeXstudio: “No dictionary Available”, although it is! How to compile current document instead of root in TeXstudio? Which file extensions shall I include when I install a new dictionary? TeXstudio - how to get access to the “added words” to dictionary?